NEW YORK, N.Y., Feb. 28, 2012 (SEND2PRESS NEWSWIRE) — Did someone tell you that your corrupted Mac drive is going to cost you a bunch of money and are you looking for a second opinion? Throw away these letdowns! EaseUS Software, a leading provider of data recovery, partition manager and backup utilities, launches its first Mac data recovery software solution today and brings you an all-in-one Mac OS data recovery software to recover unlimited types of Mac data. Additionally, we offer you an absolutely free recovery tool: EaseUS Mac Photo Recovery Free to get your precious photos back. EaseUS Mac Data Recovery Wizard provides advanced Mac data recovery solution under Apple(R) Mac OS X 10.7 (Lion) and 10.6 (Snow Leopard); and 10.5 (Leopard). With four different recovery options – Photo Recovery, Deleted File Recovery, Deep Scan Recovery, Lost Partition Recovery – EaseUS Mac Data Recovery Wizard aims to enhance the recovery process by retrieving data under almost all data loss situations and ensure data security without modifying the originally saved data on your hard drive(s). * Recover data from deleted, lost, formatted, and/or corrupted Mac hard drives; and any other media storage device(s). * Preview your recovered photos, audio and videos. * An interactive interface for better user experience. * Offer safe recovery without overwriting, modifying, or re-indexing existing data. * Deep scan recovery makes sure all data possible is retrieved. * Support HFS, HFS+, HFSX, HFS Wrapper and FAT file system. “EaseUS takes its first step in Mac data recovery field at the beginning of 2012 and will bring people more comprehensive data solution in the rest of the year,” said Mr. Liu, CEO of EaseUS Software. The company specializes in data recovery, backup software and partition manager. For Windows OS, its major products are Data Recovery Wizard, EaseUS Todo Backup and EaseUS Partition Master. 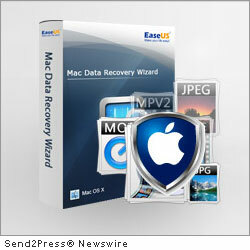 For Mac OS, it has EaseUS Mac Data Recovery Wizard and CleanGenius. For more information, please visit http://www.easeus.com. EaseUS(R) is a registered trademark of CHENGDU Yiwo Tech Development Co., Ltd. All other trademarks acknowledged. News Source: EaseUS Software :: This press release was issued on behalf of the news source by Send2Press® Newswire, a service of Neotrope®. View all current news at: http://Send2PressNewswire.com .